It's always great to try a new restaurant after reading a review or having a friend tell you about a "must-try spot" but it's even better when the recommendation comes from chefs. Food Network's new show The Best Thing I Ever Ate features favorite restaurants of Food Network celebrity chefs. After seeing an episode where Ted Allen raves about the gnocchi at Jane's in NYC, I knew I had to pay a visit! 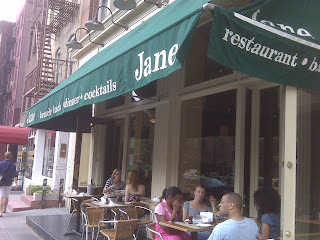 Conveniently located on West Houston Street, accessible by all trains heading to West 4th, Jane offers many great brunch, lunch and dinner options. After deciding to make this a lunch date with a dear friend and chef, we decided that it would be best if we "sampled" 3 dishes that called our attention: The Spring Lamb Ravioli, the Jane Burger and the Toasted Ricotta Gnocchi. The ravioli was interesting, but I wouldn't consider it a favorite. The burger was awesome and definitely something I would get again. 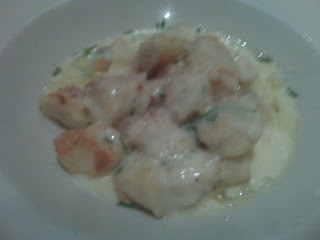 But the gnocchi...words cannot even describe how delicate, flavorful and luxurious the dish was. The ricotta gnocchi were like little clouds or pillows--light and comforting, especially considering there were lightly toasted (hard to hate anything that's fried!) The sauce was bold, creamy and cheesy. The drizzle of truffle oil was the bow on the packaging. The entire dish in itself was an experience. Naturally, I had to bring my husband here to experience it for himself. The next day we headed here for lunch. We decided on the BLT&E (egg) and the Toasted Ricotta Gnocchi. As the plate arrived his eyes lit up! As he tasted the gnocchi I new it won him over. We decided to move on to the BLT&E and savor the gnocchi for last! Don't get me wrong the sandwich was great, exactly what you want for lunch--something delicious, but nothing overly heavy--but the gnocchi is something you could wake up to. Pillows of Goodness indeed! This weekend kicked off the 2009 Fancy Food Show. Last year, I saw a posting at ICE offering an opportunity to volunteer at the event. I signed up and was appointed to work with Victoria Seasonings--a gourmet spice label offering cooks a exotic array of spices and spice blends. 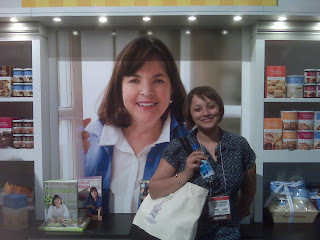 Not only did a walk away with various samplings, but slightly across from us was the Barefoot Contessa booth. As I stood admiring the set up--decorated with a tier of bite size brownies and other goodies from her pantry line--low and behold Mrs. Garten, in her signature shirt, capris, and carrying a straw "Hampton"ish bag-was strolling in. I was in awe! Eventually I managed to walk across, sample her Outrageous Brownies and say hello. Actually I said: Hello Ina, I just want you to know that I went to culinary school because of you. Her reply: Really, that's great to hear. Best of luck! And that was it, but I was elated. Anyhow, needless to say I had a great time at the show. When my work was done, my husband met me and we both sampled olive oils, cured meat, pates, cheeses, chocolates, new food trends and just about every thing that surrounded us. 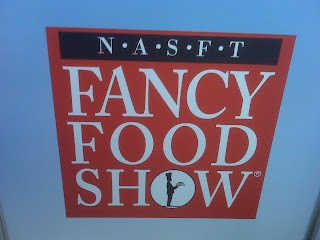 This year a friend and classmate of mine hit the Fancy Food Show together. (Unfortunately, his girlfriend was unable to attend, and my husband either) So Jeff and I (two complete foodies! )strolled through some aisles and zoomed through others all in search of great food and products. I must admit the 2 hours we spent was a total blur. We just kept sampling drinks, cheeses, hors d'oeuvres, cured meats,and many varieties of ice cream and gelatos. Three of the memorable brands was: A new product SheerBliss Ice Cream memorable because of its tin packaging. The classic D'Artagnan for their amazingly creamy mousse foie gras. Lastly, Monini a popular olive oil producer offering many types of Extra Virgin Olive Oils that we were so fortunate to sample the night before at an event held at Rustico Cooking! With our stomachs filled and our feet aching, we decided to make an exit. It was a bit past 4 and the event would end shortly anyway and we pretty much covered it all! Chef Raquel Rivera-Pablo graduated with highest honors from the Institute of Culinary Education after completing her externship at the legendary Le Bernardin in NYC. In 2009, Chef Raquel created her own cooking business—A Pinch of Salt, offering hands-on cooking instruction on the preparation of delicious and healthy meals at home. In 2010, Chef Raquel’s dedicated service to City Harvest was honored by an invitation to the launch of First Lady Michelle Obama’s Let’s Move! initiative at the White House South Lawn. Since moving to Bridgeport in 2013, Chef Raquel has shared her knowledge with the community through work with Cooking Matters and the Council of Churches of Greater Bridgeport, as well as providing technical assistance to Bridgeport’s six farmers markets. Chef Raquel is passionate about educating communities on the importance of healthy cooking, understanding nutritional information and shopping on a budget.